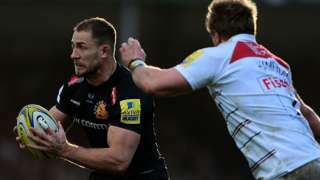 Premiership champions Exeter Chiefs end 2017 with a 30-6 win over Leicester Tigers at Sandy Park. Live updates for Devon and Cornwall have finished for the day, but we'll be back at 08:00 on Tuesday, 2 January 2018, with the latest news, sport, travel and weather. Don't forget Spotlight on BBC One through the weekend and on New Year's Day. There will also be news through the night on your BBC Local Radio station. And we'll take this opportunity to wish you all a very Happy New Year. Further disruption to travel is expected across the weekend as heavy rain passes across the South West of England. Drivers are being warned to expect flash flooding on the roads and ferry services have been cancelled because of stormy seas. Power cuts affected hundreds of homes today across Devon and Cornwall and winds gusting up to 80mph brought down trees in both counties too. Among them were eight healthy elms trees in Plymouth's Central Park. A major retail park in Cornwall, Hayle's West Cornwall Shopping Park, is closed "until further notice" after the building's roof was damaged for a second time in a week by high winds. Tonight's Plymouth to Roscoff crossing has been cancelled and passengers are having to travel from Portsmouth to St Malo instead, which will see some people having journeys of up to 24 hours. The Met Office is warning of more flash flooding, with further heavy rain forecast tomorrow. Torquay United say they are "urgently" investigating reports of racist comments from fans during their Boxing Day fixture at Eastleigh. The club said they were deeply concerned about what they termed "disgusting" comments from someone at the away end, and about the release of a smoke bomb during the game. The Gulls said: "This will never be tolerated by any football club and Torquay United condemn this behaviour in the strongest possible terms. They added: "Any perpetrator of racist abuse will be banned from the club for life, without exception, and those releasing smoke bombs will also be given lengthy banning orders." High winds and winter weather this week have caused damage to a section of the roof of an incinerator at St Dennis. On Wednesday night, nearby residents woke up to discover some of the metal sheets on the roof of the waste plant had become twisted and dislodged. Critics of the facility said it was the latest in a series of incidents they were concerned about. Operator Suez said inspections "confirmed that the roof remains structurally sound and presents no danger". It added that it had made temporary repairs, with a permanent repair expected to be carried out early next week. The company said: "Some light insulation material was blown loose and a work party was mobilised to clear up any wind-blown insulation that escaped the site. While this is clearly regrettable, it did not pose a safety risk to members of the public or personnel. "The damage will be investigated fully in due course to establish and rectify the underlying cause." A climber who became the youngest woman in the world to scale both the north and south sides of Mount Everest is to train as an Arctic polar guide. Mollie Hughes, originally from Torbay in Devon, successfully climbed the Himalayan peak from its north side in May at the age of 26, following a climb to the summit from its south side in 2012. The 27-year-old Edinburgh-based climber is to embark on 18 months of specialist training with Scottish youth charity the Polar Academy. She aims to be part of its 2019 expedition team, guiding 10 teenage pupils from Bathgate Academy in West Lothian. The charity supports secondary school age pupils who undertake 10 months of rigorous training at their school and in the Highlands before journeying for 10 days through eastern Greenland. A Devon police officer has tweeted against phone usage while driving. PC Will Heather of Devon and Cornwall Police promoted police guidelines to "set your phone to 'do not disturb' while driving". According to the force's website, 98% of road accidents are caused by human errors, known as "the fatal five". Skies will cloud over again this evening, with another spell of persistent and sometimes heavy rain. It will be windy again, but milder than of late. Saturday should start mostly dry with some sunshine. It will turn cloudier, though, with some rain likely later on. 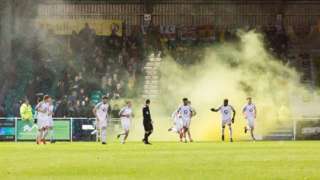 Torquay United FC fans are also accused of releasing a smoke bomb at Eastleigh FC's ground. Officers added that they hoped BT would get to the man quicker than the Friday, 5 January, appointment that had been booked, later tweeting: "Understand you are busy. Chap really was feeling low." The Plymouth section said they were not trying to out-do colleague Sgt Harry Tangye, who tweeted how he and a fellow armed response officer, who he described as "2 burly ARVs", helped clean up a Parkinson's disease patient earlier this week. Torquay United have extended the loan of Bristol City teenager George Dowling. The 19-year-old midfielder joined the Gulls in late August and has scored one goal in eight games. Last month he agreed a new contract to keep him at Bristol City until the summer of 2019. "He's shown when he is fit and available that he can add something to the team," said Torquay manager Gary Owers. "Hopefully, once he is free from suspension he can have a run of games and show everyone how good he is." Shops at a west Cornwall retail park are to remain closed "until further notice" after the building's roof was damaged for a second time in a week by high winds. A section of roof at Hayle's West Cornwall Shopping Park came loose again after high winds overnight on Thursday, resulting in the park being closed. Fire crews on an aerial ladder have been working to make it safe. Unlike a previous similar incident on Wednesday, the neighbouring A30 has remained open. The park has branches of Boots, Costa, Marks & Spencer and Next. Three stars of Cornwall-based BBC One TV drama Poldark have come up winners in this year's RadioTimes.com Reader Awards. People voted in their droves these past few weeks (with almost 100,000 votes cast) and picked the trio to receive the accolades as they celebrated the very best in television in 2017. Boslowick Road has reopened after it was closed when a tree fell on it this morning (pictured below). Castle Drive is a one-way road around Pendennis Castle and to Pendennis Head. Police in Plymouth have urged BT to fix an elderly man's phone line - after spending 20 minutes trying to book an engineer for him. The A3071 linking Penzance and St Just is one of the most dangerous roads in the South West, according to a report by the Road Safety Foundation. Police are investigating a fight in Ivybridge which resulted in two men being injured. Ivybridge Police said on Facebook the incident took place between 21:00 on 26 December and 02:00 27 December. They added that the incident was "believed to have started inside the Smithy pub and then continued outside the Co-op store in Glanvilles Mill". They have appealed for witnesses.